Identification: This distinctive animal has a blotchy, translucent-gray body with numerous black and yellow spots. The spots become proportionately smaller and more numerous with increasing age. The rhinophores are white with brilliant red clubs and the gills are white lined with red. 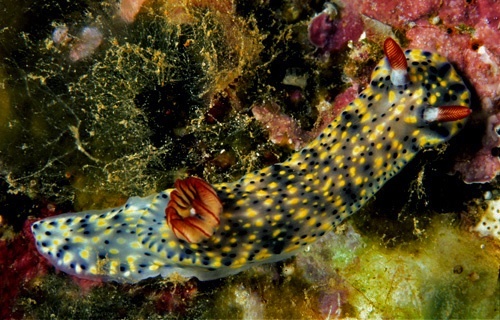 Natural history: Hypselodoris infucata is a diurnal species that is locally common in the highly protected to moderately protected mud flats and silty reef flats of Kaneohe bay, Oahu. It ranges in depth from < 1 to 11 m (< 3-35 ft). Occasionally, it has also been found on Oahu in somewhat more exposed habitats though on Maui we've seen it only in Kahului Harbor, another protected site. It feeds on the gray sponge, Dysidea fragilis (Bertsch & Johnson, 1981), and lays a white egg mass. Distribution: Big Island, Maui and Oahu: widely distributed in the Indo-Pacific; introduced into the Mediterranean. Taxonomic notes: It was first recorded in Hawaii at Fort Kam Reef, Oahu by Michael deGruy on Sept. 24, 1977. The name means "painted" and it's referred to as the "painted nudibranch" in Hoover, 1998 & 2006. Photo: Mike Severns: found by John Hoover; Mokoli'i Island, Oahu; March 29, 1997.